A rather special baby is delivered, initiating an apocalyptic chain of events. But there is a problem. Stars Peter Serafinowicz. From December 2014. According to the Nice and Accurate Prophecies of Agnes Nutter, the world will end on a Saturday. A Saturday quite soon, here on Radio 4. Supernatural beings, humans, apocalyptic riders and the actors who play them. Peter Serafinowicz (Crowley) and Mark Heap (Aziraphale) deliver famous lines to camera. 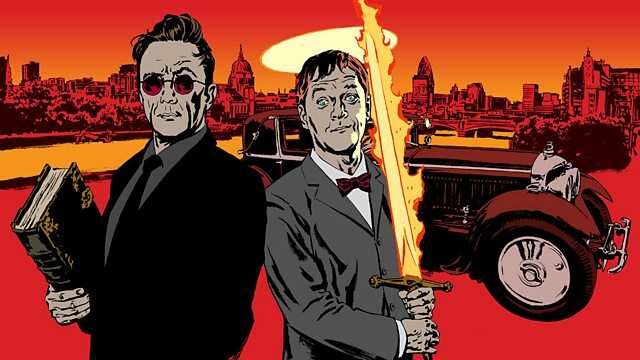 The artists behind Radio 4's Good Omens images. Meet the main characters of our new Neil Gaiman book dramatization.